Small.Quick.The best checklist value available. Smaller than our PRO Version, our Pocket-Version checklists offer an inexpensive way to keep vital checklist information at your fingertips. All the essential information you have come to count on from SureCheck products is here: normal, soft- and short-field procedures, full v-speed listings, and a durable laminated coating. 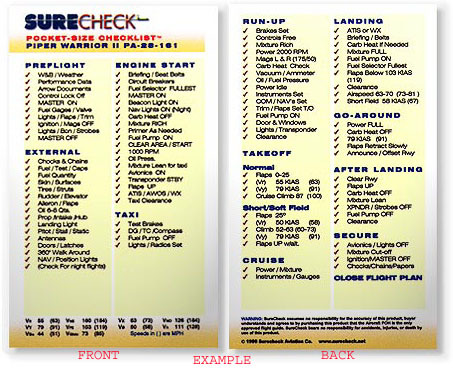 Professionally designed to be easily read with large enough type, this line of checklists also makes a perfect companion to our Full-Version checklists.